American Alligators are amazing creatures. Males can grow up to 11.2 feet long and female alligators can grow up to 8.2 feet long. You can quickly tell if an alligator is an adult or a child just by looking at its tail. If its a adult it has a black stripe on its tail and kid ones have yellow stripes on there tails. Adult alligators can way up to half a ton that's 1.000 pounds! If you saw an alligator foot you can tell which way it was facing because the front feet has 5 toes and the back have 4. Even whit'h all of there power some animals still atack. so just incase alligators have bony plates on there body called sutes. Now that's unstoppable! Once endangered in the state of Florida, alligator populations have exploded recently, increasing the chance of a human encounter! 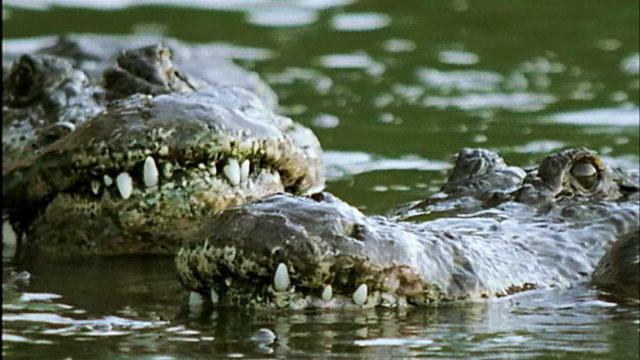 American alligators are now thriving but that does not mean that they are not being killed. One problem american alligators are having is the destruction of their habitat. Many people think that the land is good for building on so they make golf courses and build homes killing many of them. Another problem is big companies dump all of their waste into the water killing and poisoning the alligators. some Solutions could be we could make their habitats wildlife preserves. Another solution could be make stronger laws about building and hunting alligators. Many people think alligators and crocodiles are the same thing but they are very different. For starters alligators live in america and crocodiles live in Africa. Also Alligators have u shaped snouts when crocodiles have v shaped snouts. another reason they are different is the alligators are not aligned evenly the upper jaw overlaps the lower jaw with crocodiles the teeth are aligned straight. things that are the same about them are they have webbed feet they are cold blooded they are nocturnal and both eat fish.